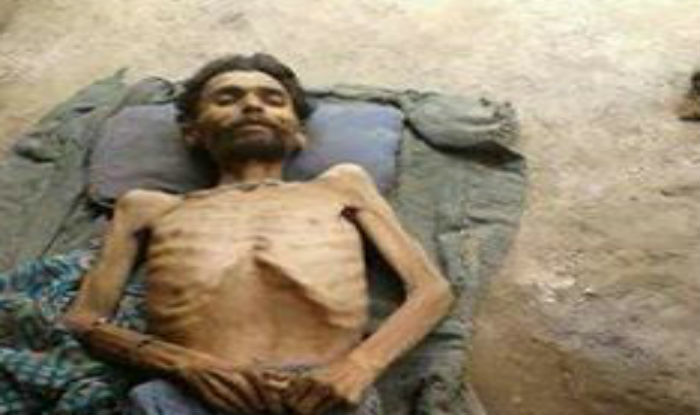 Srikant Dixit, a 40-year-old farmer did not die of hunger, claim authorities in Uttar Pradesh. These authorities base their conclusion on the post-mortem report, which states that there was 50 grams of food in the man’s stomach. Yes, for authorities, finding 50 grams of food in the stomach of a man starving for 12 days is enough to refute a starvation death. This is despite the likely possibility that the deceased’s aged mother, who had been begging for wheat flour, fed it to her son with water in her last ditch attempt to make him survive. Authorities find they have to deny starvation deaths, as the state government holds the District Magistrate responsible for any starvation causality. Ironically, no District Magistrate in the state, and perhaps in whole country, has ever been penalized for starvation deaths. The reason behind this is simple. Forget statistics proving otherwise, from those of government agencies, the United Nations, or other watchdogs, no one dies of hunger in India according to local officials. Local officials always find, in fact, invent, reasons other than hunger for such deaths. They may list the cause as diarrhea, for children of the indigenous communities in Madhya Pradesh that starved to death. It might be tuberculosis for the middle-aged and elderly people, from rickshaw pullers in metropolitan cities to destitute elderly singles in villages. Thankfully, for the authorities, the list of such diseases to attribute the cause of death is endless. So, what if the Constitution of India, which these authorities are obligated to uphold, guarantees right to life with dignity to every single citizen, be s/he rich or poor. Guaranteeing a right is meaningless unless there are institutions to implement and monitor the implementation of these guarantees on the ground. The Indian authorities can happily bank upon the double delight of the absence of any such institutions, coupled with a rotten, farcical, and dysfunctional justice system that virtually never penalizes violation of constitutional guarantees. Think about it: there is no dearth of government welfare schemes to help people like Srikant Dixit. But not a single one of these schemes reached him in his Pakariya Village under Asaundra Tehsil of Barabanki District when he needed them the most. His family was not categorised as Below Poverty Line, which would have entitled it subsidised rations, which in turn could have saved him. He did not have any job card under Mahatma Gandhi National Rural Employment Guarantee Act (MNREGA), which would have entitled him to at least 100 days of work a year either. He survived as a daily wage labour working odd jobs he got, if any. And, like all such workers, he had nothing to fall back upon if he fell ill, as the welfare schemes are all in paper on some official’s desk, and not in his village. He might have thought of registering a complaint, seeking redress, but then there are no such places for the poor in India. The courts take decades to adjudicate murders; they have no any time for someone seeking a ration card that he needed! Even if there were such a court by some miracle, he would not be able to afford an advocate, for the very same reason he needed the BPL ration card! Srikant did not die in a day; no one does. The people and authorities around would not have been unaware; every village in Uttar Pradesh has at least three authorities: an elected village chief, and a village secretary, and revenue clerk from local administration. They would have known and should have intervened. They are obligated to do that. They did not. The very fact that the death occurred despite them being around speaks about how institutions work. Sadly, this is not the story of just one man. It is the collective collapse of a system that first fails to protect the citizens and then denies the failure with impunity: no one is fired, no one gets penalised, and no redress offered to victims. Until both the people of the nation and its authorities can look at the reality around them the way it is, and call a starvation death a starvation death, all manners of perverse actions will abound. The day the nation and its people are able to see reality as it is, they will not be able to ignore how their institutions and, in particular, their justice institutions, are generating utter misery. That will be the beginning of the end of dysfunctional institutions and authorities that work against the people, spinning blatant lies as gospel truth.